Our first exhibition at the blockchain live event went really well. We were confident it was going to be a popular event but were still surprised by the huge turn out. By 9:30am the fintech presentation area opposite and in direct view of our booth was full. Luckily we got setup the day before and were ready to go as soon as the doors opened. The booth looked great with full background display which was designed in house. The large screen monitor displaying the platform mining drew people in and allowed us to demo the other platform features. We were absolutely rammed from 9am-5pm when the doors closed which was great but meant we were dead on our feet by the end of the show and none of us got to go around and networked with the other exhibitors. 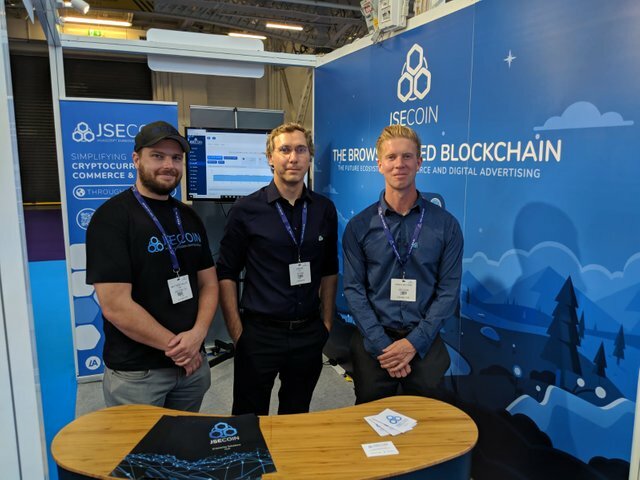 Can’t complain though as it was an excellent first event for the JSEcoin team and everything went better than we could have hoped. We gave out in excess of 150 whitepapers, another 100+ onepagers, 400+ business cards, 50+ coincode booklets and 30+ enterprise solutions flyers. We met interesting people throughout the industry. Recruitment and R&D tax break specialists seems to be very hot right now with a number of companies contacting us in both fields. We made some great connections with designers, security consultants, potential investors and exchanges as well as a number of potential partners in both ad-tech and ecommerce. Ad-tech london was going on next door and there was definitely a spillover effect where people were attending both events. This couldn’t have worked out better for us, attendees with an interest in crypto and ad-tech delivered a perfect audience for our project. Here are some photos of the booth and team on the day. Thanks to everyone that came along and we are very grateful to everyone that worked hard to make this event an outstanding success. Hopefully it works well, and for @jsecoin, good luck brings the goal to success. Good luck to your project guys. Please please follow me and give me upvote. Hoping that this platform runs well in cryptocurrencies. I like mining it through my old laptop for about 6 hours a day. Great work, Jsecoin.